Although this year's flu season is running a bit later than usual, early numbers suggest that this year's flu vaccine is about 50% protective against the dominant H1N1 virus, and nearly 80% protective against the B/Yamagata lineage of influenza B. Given that we've yet to see the peak of the regular flu season, and influenza B often peaks later in the spring, there is still time to get a flu shot if you haven't. While the level of protection against H1N1 this year is non-spectacular, a 50% reduction in the odds of getting the flu is still nothing to sneeze at. I get my shot every year, and urge others to consider doing so as well (see #NatlPrep: Giving Preparedness A Shot In The Arm). As an added bonus, in recent years we've seen studies suggesting the flu jab may also provide significant protection against coronary events (see UNSW: Flu Vaccine Provides Significant Protection Against Heart Attacks). Global flu experts will be meeting in the next week or two to decide on the formulation of next fall's flu vaccine, and with an increasingly complex array of flu viruses circulating each year (see ECDC Influenza Characterization), that job isn't getting any easier. One hedge you might want to consider is getting the quadrivalent flu vaccine, containing both Victoria and Yamagata lineage B strains (see Two B's Or Not Two B's? That Is the Question). We'll get an end-of season VE analysis from the CDC probably by early summer. Weeks of ongoing flu activity still ahead; CDC urges flu vaccination. The Centers for Disease Control and Prevention today reported preliminary overall influenza vaccine effectiveness (VE) of 59 percent this season. These data were presented at a meeting of the agency's Advisory Committee for Immunization Practices (ACIP) in Atlanta. This finding is comparable to past estimates for seasons when most circulating flu viruses and vaccine viruses have been similar. "This means that getting a flu vaccine this season reduced the risk of having to go to the doctor because of flu by nearly 60 percent,” said Joseph Bresee, M.D., chief of CDC’s Epidemiology and Prevention Branch. "It’s good news and underscores the importance and the benefit of both annual and ongoing vaccination efforts this season." At this time, there are not enough data to estimate VE by age group, nor to estimate VE against H3N2 viruses or B/Victoria lineage viruses. CDC maintains and monitors several influenza surveillance systems. This season, influenza-like-illness levels and the numbers of influenza-positive laboratory tests became elevated the week ending January 16. Activity now has been elevated for five consecutive weeks. For the past 13 seasons, flu seasons have averaged 13 weeks in length, with a low of one week to a high of 20 weeks. "Flu activity this season started a bit later and has been lower so far than we've seen during the previous three seasons, but activity is still on the upswing and expected to continue for several weeks," said Bresee. "Flu causes serious illnesses and deaths every year. This season, CDC has received reports of hospitalizations and deaths in young, otherwise healthy people who were infected with influenza A H1N1, but not vaccinated." 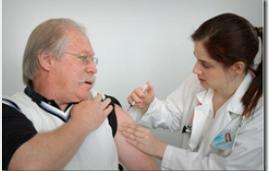 While flu vaccine effectiveness can vary, CDC recommends an annual flu vaccine as the best way to prevent seasonal flu. CDC also recommends rapid treatment of seriously ill and high risk suspect flu patients with influenza antiviral drugs. Interim VE estimates are based on data collected from the U.S. Flu VE Network from November 2, 2015, through February 12, 2016. With weeks to go for the current flu season, VE estimates may change. CDC will continue to publish influenza laboratory and disease surveillance data weekly in FluView. Updated VE estimates will be provided as warranted and final VE estimates will be published after the season ends. Also at the February 24, 2016 ACIP meeting, the committee renewed the universal recommendation for influenza vaccination, which has been in place since 2010. The committee also amended language related to flu vaccine recommendations for egg-allergic patients so that they may now receive the live attenuated influenza vaccine (LAIV).